Mark Smith caught up with Gourmet Traveller Wine’s 2018 Viticulturist of the Year, Fred Peacock. With the sun on his back, Bream Creek’s Fred Peacock moves steadily between narrow rows of sprawling Pinot Noir, wrenching away unruly canes and tucking others between foliage wires on his 7.5 hectare site overlooking Marion Bay in southeast Tasmania. To the casual observer, it is mindless, repetitive work; the unromantic side of the island’s cool climate viticulture. Peacock speaks with the voice of experience. He’s been traversing Tasmanian landscapes for more than four decades now. Even so, the daily schedule he sets himself is every bit as demanding as it was when he first stepped onto a vineyard in 1974. Indeed, Peacock now owns or manages 30ha of vines in three industry subregions – the East Coast, Coal River Valley and Derwent Valley. That’s the price he pays for being ‘legendary’ – not Peacock’s words, but those of widely respected critics, including James Halliday AO and Huon Hooke. 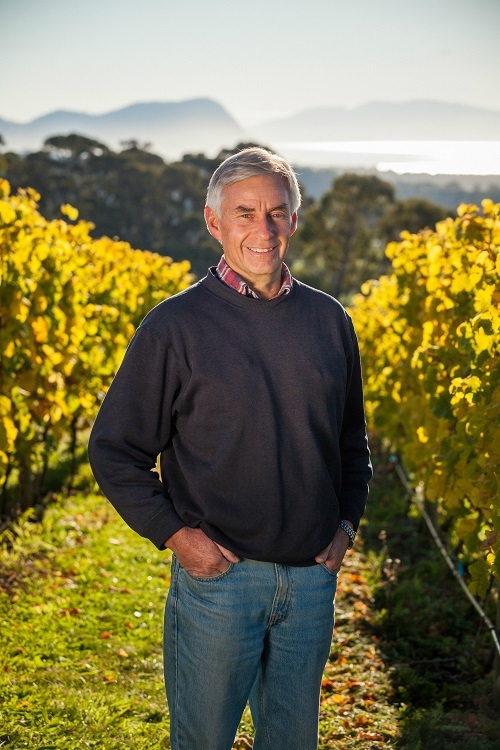 Back in August 2018, Peacock’s position of pre-eminence in the wine industry was confirmed when he was named Viticulturist of the Year 2018 by leading Australian publication, Gourmet Traveller Wine. “What he doesn’t know about growing grapes on the island is probably not worth knowing,” noted its judging panel. Personal accolades don’t sit comfortably with this genial, self-effacing bloke. He’s happier tending vines. Peacock credits much of that mindset to genetic makeup. The Peacock family has been at the heart of the Tasmanian fruit industry since George Peacock arrived in Hobart from Somerset in 1850. The Englishman later founded a jam-making business that grew to become one of Australia’s leading food brands in the 20th century, Henry Jones IXL. It’s hardly surprising that horticulture was the focus of Fred Peacock’s studies at the University of Tasmania. Armed with a degree in agricultural science, he then gained employment with the Department of Primary Industry’s Fruit and Ornamentals Branch in 1974. Peacock spent a decade working with mixed horticultural crops before becoming inaugural Tasmanian state viticulturist in 1984. In 1989, Peacock moved to Moorilla Estate as its general manager. Based in the Derwent Valley, just north of Hobart, and nowadays the site of the Museum of Old and New Art (MONA), the property was home to wine pioneer Claudio Alcorso. Peacock’s stint there was to do more than offer first-hand experience of the cyclical nature of grapegrowing. It led him to the state’s east coast and five hectares of windswept vines 10 kilometres from Tasman Peninsula. Bream Creek Vineyard was owned by a syndicate of business operators, including Peacock’s mentor and former horticulture lecturer, Dr Bob Menary. The site had been planted in 1974 to supply Riesling, Pinot Noir and Cabernet Sauvignon to Alcorso’s ambitious wine venture. When Bream Creek’s disenchanted owners decided to auction the property in 1990, Peacock was the last bidder standing after protracted negotiations with the vendors. He remembers his first few years of ownership as hectic and scary. Roughly 40 percent of his acquisition was planted to Cabernet Sauvignon, a variety he acknowledges can be difficult to ripen in the southern latitudes of mainland Australia, let alone in ultra-cool southeast Tasmania. A view across Bream Creek Vineyard overlooking Marion Bay, 10 kilometres north of the Tasmanian Peninsula on Tasmania’s southeast coast. When Fred Peacock assumed ownership of the vineyard in 1990, roughly 40 percent was planted to Cabernet Sauvignon, which he subsequently removed, along with some minor varieties including Alicante Bouschet, Gewürztraminer, Müller-Thurgau and Pinot Blanc. He then planted experimental rows of Sauvignon Blanc to determine which clones and management practices were best suited to the site. Peacock removed the vines, along with the site’s traditional but inefficient T-trellising system. A smattering of minor varieties including Alicante Bouschet, Gewürztraminer, Müller-Thurgau and Pinot Blanc were grubbed out as well. Peacock then planted experimental rows of Sauvignon Blanc to determine which clones and management practices were best suited to his site and growing conditions. Peacock attributes most of his early viticultural understanding to a grower workshop and tasting of Tasmanian wines held in Launceston in 1983. It was conducted by University of California Emeritus Professor Dr Maynard Amerine. The renowned researcher, whose doctorate addressed climate effects on grapes, applied a purely scientific approach to the sensory perception of wine. Peacock has vivid recollections of the workshop. “It was incredible,” he says. Over subsequent decades, Peacock has remained true to his vision of creating one of the state’s best managed vineyard sites by planting varieties he perceives as being particularly well suited to Bream Creek. Preferred selections of Chardonnay, Riesling and Pinot Noir are no surprise, but a more obscure variety has also held his attention – Schönburger. The German hybrid first entered Peacock’s consciousness during his time with the Tasmanian Department of Primary Industry. Its Fruit and Ornamentals Branch was given a brief to identify grape varieties likely to be well suited to cool climates and have potential for the state’s emerging wine industry. On the advice of German viticulturist Helmut Becker – then head of the Geisenheim Grape Breeding Institute – Reichensteiner, Ehrenfelser and Schönburger were singled out. These were imported into Australia through the CSIRO at Merbein in Victoria. In 1982, the varieties were released to Tasmania’s Department of Primary Industry and became part of a field trial to assess their suitability for the state. It soon became apparent that Schönburger was a variety the industry could take seriously. The result of a crossing of Pinot Noir with Chasselas Rosé x Muscat of Hamburg, it had the best aromas and flavours of the three German hybrids under investigation. It also had the advantage of being a reliable setter and a good cropper under Tasmanian conditions. “Schönburger is very disease resistant, too, especially for botrytis, and it just looks fantastic,” Peacock explains. When Peacock established the variety at Bream Creek in the 1990s, he believes it was the first commercial planting of Schönburger anywhere in the Southern Hemisphere. His long-term faith in it continues to be rewarded almost annually. In 2018, for example, his 2017 Schönburger won the Stewards’ Choice Trophy at Mildura’s Australian Alternative Varieties Wine Show. 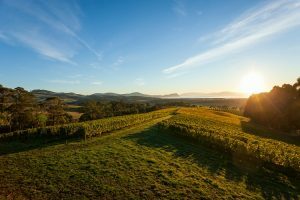 “When we first took over Bream Creek Vineyard, this part of Tasmania’s southeast coast was especially challenging viticulturally because growing conditions were so cool and so marginal,” Peacock says. “Rainfall was a lot higher then than it is today and we had real problems keeping disease at bay. We now know that average annual rainfall at Bream Creek has fallen by 10% since 1990. In fact, reliable data indicates October rainfall during the same period has fallen by 20%. December rainfall has declined by 25%. “Average monthly temperature maxima, however, don’t appear to have moved much over the century. It’s the levels of solar radiation that have changed. In spring, levels of solar radiation since 1990 have increased between 2.3% and 4.3% when compared with long-term averages dating back to 1900. In summer, increases in solar radiation since 1990 have been far less impressive, with increases somewhere between 0.4% and 3.2% – not statistically significant, but perhaps the start of a trend that will increase over time. “It’s a bit ironic, but climate change to date has been beneficial to parts of the Tasmanian industry. Scientists recently discovered that the East Australian Current that runs down Tasmanian’s east coast is the fastest warming ocean current in the world. That current used to peter out around Maria Island, just north of Bream Creek. Nowadays, it extends further south and runs closer inshore. Climate sceptics may challenge some of the causal factors at work in southeast Tasmania over the past 30 years, but one conclusion appears irrefutable. Consistently more favourable growing conditions have made this part of the island far more reliable as a wine-producing area. “They have also enabled us to fully ripen a wider range of varieties despite all that the seasons can throw at us,” Peacock concludes. 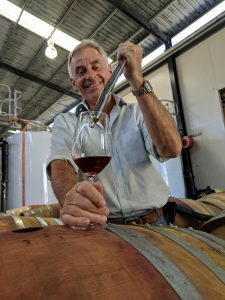 Fred Peacock samples wine from a barrel at contract winery Winemaking Tasmania. This article was originally published in the January 2019 issue of Grapegrower & Winemaker magazine. To see what’s on offer inside the January issue, click here, and to subscribe to the Grapegrower & Winemaker magazine, click here.